AFR Controller and Monitor Combo pack with sensor & engine monitor and Air FUle Ratio Control Center. Choose either Wide Band or Narrow Band. Choose below. This monitor reads you everything about your engine and sensors. 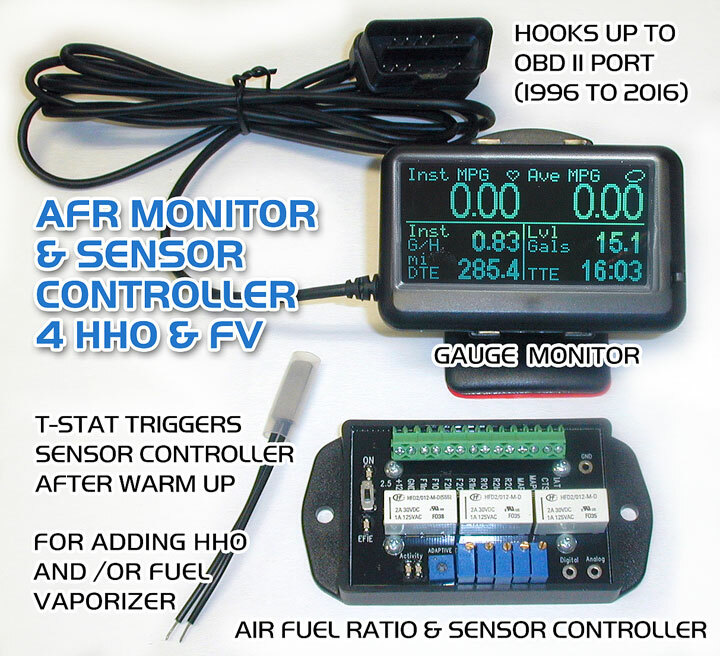 We tell you how to set each sensor for best MPG gains with HHO added or Fuel Vaporizer The AFR Monitor Guage hooks up to your OBD II port under the dash. Comes with dash mounting bracket. Wide Band AFR Control Center Totally control all your sensors that hinder your HHO or Fuel Vaporizing gains from happening. Wide Band O2 sensors (5 wires) are in Toyota 1999 to 2016 , Honda, Nissan, Mitsubishi, VW and GM : Chevy, Cadillac, GMC, Buick, FORD, Chrysler : Dodge, Jeep 2010 to 2016 cars and trucks. If you have a Narrow Band O2 sensor go here.